"One of the biggest phenomena in my time was Toscanini. England, for one, certainly went crazy for him - so much so that he was an absolute pest as far as I was concerned. First and foremost, I did not like his conducting. I have to give him credit for the fact that he got an incredible clarity out of the orchestra. But it was absolutely without humanity, even rigid. If Toscanini had been in one hall and Beecham in another I would have gone to see Beecham any day. Toscanini seemed to have a power over people and could do no wrong. On one occasion he snatched the camera from a journalist, threw it to the ground, and stamped on it! However it was more than ones' life was worth to criticize Toscanini or to say you didn't like him. You would have to defend yourself to a degree that I didn't feel like doing. 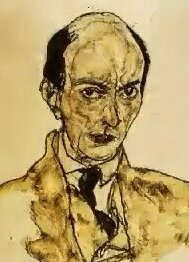 One summer I was doing a summer school in Santa Barbara, California with Schoenberg. One day I gathered my courage and asked him, "Arnold, what do you think of Toscanini?" And he spat and said, "That bandmaster," with a great deal of derision in his voice. He went on to tell me that Toscanini had received all his musical training in military school, which explained everything." The quote above is taken from A Cellists Life by Griller Quartet cellist Colin Hampton. 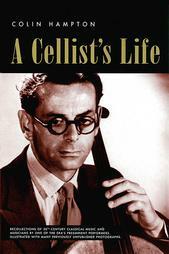 It is a fascinating read which roams across a wide range of composers. About Ernest Bloch he writes: "His string quartet No 1 is to me one of the great works in this world. It was a logical conclusion, as far as I am concerned, to the Beethoven quartets. I would put Bloch in front of Schubert and Brahms anytime." Ernest Bloch is one of those unfortunate composers branded by a single work, in his case Schelomo (which I have to confess I wouldn't shed a tear if I didn't ever hear again). His string quartets, which inhabit a sound world somewhere between Shostakovich and Schoenberg, are very different, and something of a challenge, with the first lasting for almost an hour. But they are most certainly great works which reward exploration. And the recent re-issue of Colin Hampton and his colleagues in the Griller Quartet playing Bloch's four string quartets gives us a chance to explore and reappraise these neglected works. The sound from these mono 1954 Decca studio recordings is staggeringly good. The producer is my old boss from my EMI days, Peter Andry, recorded when he was at Decca. I was talking to a violin playing friend about why early recordings such as this have such a good string tone. (The various Artur Grumiaux recordings on Philips are another outstanding example). His view was that it is not the recording technology that has gone backwards (although some would argue that is also the case), but rather that string playing technique has evolved to a leaner, more analytical sound. If that is so it is a shame, and may explain why so-called 'authentic instrument' recordings with their gutsy string tone are so popular (I was listening to the Salomon Quartet recordings of Mozart using original instrunents on Hyperion the other night, thinking what fantastic sound the players were producing) . 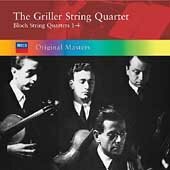 A book remains to be written about the Griller Quartet, who based on these recordings deserve their place up their with the Amadeus and Hollywood in the pantheon of all time great quartets (I must explore their Mozart and Haydn on Dutton). John Amis writes in his autobiographical 'Amiscellany': "Later the Grillers went to the States, their stay their ending in stark tragedy when an internal homosexual fracas ended in denunciation to the police and sudden death, at which point the always happily married Sidney Griller came back to England." * MP3 file of Toscanini conducting the NBC Symphony in the adagio molto e cantabile from Beethoven's 9th symphony from the superb Finnish national radio station YLE Radio 1, many more wonderful audio files there - do visit. "it is not the recording technology that has gone backwards (although some would argue that is also the case), but rather that string playing technique has evolved to a leaner, more analytical sound." Your friend is quite right - it's not the technology. In fact, I’m beginning a recording project in London this weekend where we'll be using microphones built in the 1950's. Not the same type - but the very same mics, which remain highly sought-after and implausibly valuable. And without question, the mics have a greater impact on the sound quality than most other factors combined. The notable exceptions are of course the musicians; the acoustic, and the engineers’ skill in placing the microphones. The last 30 years bear witness to the fact that paucity of the latter allows any number of potentially silk purses to be unwittingly transformed into the ubiquitous pig's ear. Ah, those were the days! "Confirmed bachelor" being the polite way in those dangerous, pre-Wolfenden Report days to say "Gay gay gay gay gay GAY". I couldn't find any info about said fracas, Pliable, do you know any details? online article from 1950 you refer to, with it’s excellent black and white photograph, is the best source on the Griller Quartet, but it predates their breakup. Can any other readers supply any more information? The creative, and personal, tensions within string quartets are a fascinating subject which have produced some very interesting books including Married To the Amadeus and Indivisible By Four. I believe that music is more than just music. It is not an isolated phenomenon; it cannot escape from the perception of that which is occurring all around us in this world of war, suffering, and the demise of charity.